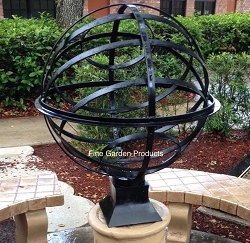 Wonderful brass armillary sphere, armillary ball, bronze celestial globes; made of aluminum, brass, bronze and cast wrought iron for your home and garden. These are miniature representations of the earth, moon, and planets in the form of terrestrial or celestial globes, terrain models and armillary spheres. Some sources credit Greek philosopher Anaximander of Miletus (611-547 B. C.) with inventing the armillary sphere, others credit Greek astronomer Hipparchus (190 - 120 BC), and some credit the Chinese. Armillary spheres first appeared in China during the Han Dynasty (206 B.C.-220 A.D.) The exact origin of armillary spheres cannot be confirmed. However, during the Middle Ages armillary spheres became widespread and increased in sophistication. The earliest surviving globes were produced in Germany, some were made by German map-maker Martin Behaim of Nuremberg in 1492. 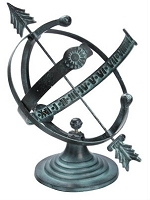 Now that you have a little back round we suggest using a armillary as a focal point in your garden; at the end of a garden path or in the center of a courtyard or center of a squared in hedge with lovey flowers planted around it.